The six mega banks profiled in the report are: Bank of America, Citigroup, Goldman Sachs, JPMorgan Chase, Morgan Stanley and Wells Fargo. A reliable source tells us that all major business media received the report on Tuesday, April 9. We know that Politico had the report by 8:00 a.m. because its “Morning Money” column provided a small news nugget at that time announcing that the report was out. Politico did not follow up, however, with any detailed coverage of the shocking revelations in the report. We know that the Wall Street Journal was aware of the report because Lalita Clozel, a banking regulation reporter for the Wall Street Journal, Tweeted on April 10 that Democrats in the House Financial Services Committee room were handing out the report to journalists while the Chair of the Committee, Congresswoman Maxine Waters, was introducing the bank CEOs. Despite almost one-third of American adults having been arrested, not one CEO or top executive of the serially charged mega banks has seen the inside of a jail cell, despite criminal referrals from the Financial Crisis Inquiry Commission. Wall Street On Parade has been regularly using the phrase “rap sheet” since 2013 as a mountain of evidence emerged that at least some of these mega banks were, in fact, running a crime syndicate. 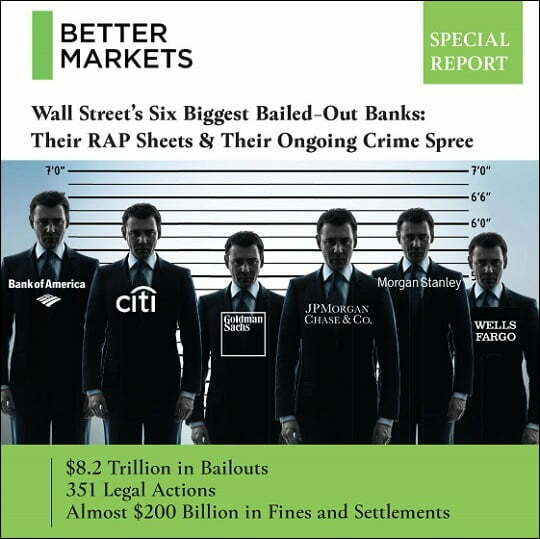 We have also repeatedly published the detailed rap sheets for Citigroup and JPMorgan Chase. There is also another reason that big business media found the Better Markets report too hot to handle. Since at least 2013 there has been a concerted effort on the part of lawyers and giant public relations firms working on behalf of Wall Street and its trade associations to silence any media suggestion that Wall Street is inherently evil, criminal or has a business model of fraud, as Senator Bernie Sanders has correctly asserted. In 2013, Maria Bartiromo (then at CNBC and now at Fox Business Network) appeared on Meet the Press. Her message was: “We need to get beyond the conversation of is Wall Street evil.” There was no substantive reason for the American people to get beyond that conversation in 2013 because the mega banks had been making headlines for outrageous crimes against the investing public. Bartiromo spent two decades at CNBC before joining Fox Business Network in January 2014. At CNBC, as we previously reported, there appeared to be a co-branding operation in play between Bartiromo and Citigroup, one of the mega banks with a very long rap sheet. “Only in the warped, distorted, Alice-in-Wonderland world of Wall Street would one think ‘Washington went to war against big Wall Street banks’ or that ‘Washington won [the war] in a blowout,’ as said today in a Politico article…It may be counterintuitive, but the article reflects a fairy tale Wall Street loves to push. Not only that they have been picked on and been under/are under enormous pressure (almost all unfair, undeserved and counterproductive) by US and global regulators, politicians and policy makers, but, hey, they’ve lost and Washington won, so, ease up. No need to take any further action against the ginormous global too-big-to-fail banks that are bigger, more interconnected and dangerous than they were before the last crisis that they caused. No. Enough’s been done. Schoen is a founding partner and former strategist for Penn, Schoen & Berland, a market research, political polling, and strategic consulting company that was acquired by the marketing and communications juggernaut known as WPP, which owns the powerful strategic communications firm, Burson-Marsteller. Mike Bloomberg, who has considered a presidential run, is worth $59.6 billionaccording to Forbes. The lion’s share of Bloomberg’s wealth derives from the hundreds of thousands of Bloomberg terminals that his company leases to the trading floors of the mega banks profiled in the Better Markets report, along with their foreign counterparts. Mike Bloomberg is also majority owner of the corporate entity that owns Bloomberg News. The assertion that Goldman bankers “can hold their heads up high” contradicted an immensely deep body of evidence at the Securities and Exchange Commission, the U.S. Department of Justice and the Financial Crisis Inquiry Commission. The Better Markets report tallies up over $9 billion in fines that Goldman Sachs was forced to pay over its fraudulent actions related to the financial crisis. One of the fines was the $550 million that Goldman Sachs paid for allowing a hedge fund to pick instruments designed to failfor its Abacus offering, while selling the product to other investors as a good deal. The day after Greg Smith’s OpEd ran, Mayor Bloomberg hurried down to Goldman Sachs to rally its traders, shaking hands with them on the trading floor and having a burger lunch with Goldman Sachs’ then CEO, Lloyd Blankfein, according to the New York Times. Other nefarious things have happened in New York City showing a dark, outsized influence from Wall Street. The criminally charged mega banks have been allowed to jointly staff, alongside the NYPD, a surveillance center where law-abiding citizens are routinely spied upon. (See 60 Minutes Takes a Pass on Wall Street’s Secret Spy Center.) Under Mayor Bloomberg’s watch, the peaceful protesters of Occupy Wall Street, who were attempting to wrench American democracy from the iron-grip of the one percent, were punched and pepper-sprayed and brutally evicted from Zuccotti Park. The news blackout of the critically important Better Markets report is just one more step in America’s march toward totalitarian control by billionaires. You can help change that outcome by writing to the Democrats who are now in charge of the House Financial Services Committee and demand that they hold a hearing on the findings of the Better Markets report. To help you decide if these rap sheets are as bad as we suggest, here’s the rap sheet of JPMorgan Chase, the largest bank in the United States, as chronicled by two trial attorneys in the book JPMadoff: The Unholy Alliance between America’s Biggest Bank and America’s Biggest Crook. “In April 2011, JPMC agreed to pay $35 million to settle claims that it overcharged members of the military service on their mortgages in violation of the Service Members Civil Relief Act and the Housing and Economic Recovery Act of 2008. “In March 2012, JPMC paid the government $659 million to settle charges that it charged veterans hidden fees in mortgage refinancing transactions. “In October 2012, JPMC paid $1.2 billion to settle claims that it, along with other banks, conspired to set the price of credit and debit card interchange fees. “On January 7, 2013, JPMC announced that it had agreed to a settlement with the Office of the Controller of the Currency (‘OCC’) and the Federal Reserve Bank of charges that it had engaged in improper foreclosure practices. “In September 2013, JPMC agreed to pay $80 million in fines and $309 million in refunds to customers whom the bank billed for credit monitoring services that the bank never provided. “On November 15, 2013, JPMC announced that it had agreed to pay $4.5 billion to settle claims that it defrauded investors in mortgage-backed securities in the time period between 2005 and 2008. “On December 13, 2013, JPMC agreed to pay 79.9 million Euros to settle claims of the European Commission relating to illegal rigging of benchmark interest rates. “In February 2012, JPMC agreed to pay $110 million to settle claims that it overcharged customers for overdraft fees. “In November 2012, JPMC paid $296,900,000 to the SEC to settle claims that it misstated information about the delinquency status of its mortgage portfolio. “In July 2013, JPMC paid $410 million to the Federal Energy Regulatory Commission to settle claims of bidding manipulation of California and Midwest electricity markets. “On November 19, 2013, JPMC agreed to pay $13 billion [that’s billion with a ‘b’] to settle claims by the Department of Justice; the FDIC; the Federal Housing Finance Agency; the states of California, Delaware, Illinois, Massachusetts, and New York; and consumers relating to fraudulent practices with respect to mortgage-backed securities. “In December 2013, JPMC paid $22.1 million to settle claims that the bank imposed expensive and unnecessary flood insurance on homeowners whose mortgages the bank serviced. Don’t get the idea that JPMorgan’s crime spree ended in 2015. In 2016 JPMorgan agreed to charges by the SEC that it had steered its customers into in-house products where it reaped higher profits without disclosing this conflict to the customer. It paid $267 million to settle these charges. In 2017 it paid $53 million to settle charges that it had discriminated against minority borrowers by charging them more for a mortgage than white customers. Just last year alone, JPMorgan was repeatedly charged. In October it agreed to pay $5.3 million to settle U.S. Treasury allegations that “it violated Cuban Assets Control Regulations, Iranian sanctions and Weapons of Mass Destruction sanctions 87 times,” according to Reuters. As recently as December it settled claims with the SEC for $135 million over charges that it had improperly handled thousands of transactions involving the shares of foreign companies. And it is currently under a new raft of investigations and allegations, including a criminal investigation by the U.S. Justice Department over its conduct in the precious metals market, according to its own 10K filing with the SEC. But until corporate media stops censoring hard news about Wall Street and the public demands action by Congress, we all remain Wall Street’s muppets.